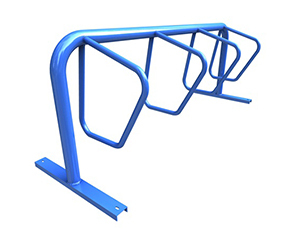 The Campus Rack is optimized for secure, convenient and orderly parking of bicycles and scooters. The overarching cross support beam with hanging lock-bars, reverently referred to as 'ears', which serve as a supportive guide keeping front wheels and forks from twisting—while also maintaining a high level of security. The all-steel, MIG welded Campus Rack is constructed with a 3"O.D. round tube cross support beam and 1-1/5"O.D. round tubing for the hanging lock-bars. 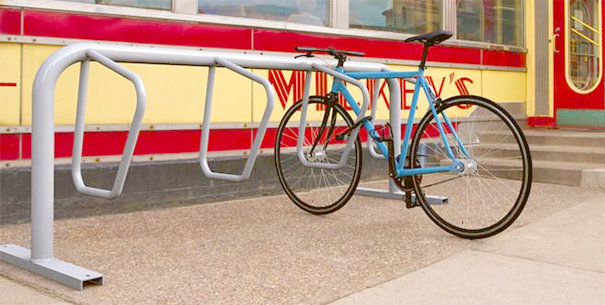 Finished in a galvanized or powder-coating, theses single sided Campus Racks hold in total of up to 3-6 bikes or scooters—great for streetscapes, sidewalks and parks.